This is an introduction to Bangladeshi flavors in a form that’s familiar to both toddlers and elders alike ~ a lush cardamom sponge cake drenched in coconut cream and covered with a cloud of fresh lime zest whipped cream. It's reminiscent of a love child between a tres leches and a ras malai dessert. A longtime favorite from Chotpoti, I'm glad that I can share this etheral dessert with you. Place a rack in the center of the oven, and preheat oven to 350 °F. Butter the bottom and sides of 9x13 baking dish. Place the butter and honey in a microwave-safe bowl, and melt together in the microwave (about 1 minute). Mix to combine, and set aside to cool. Mix together the all-purpose flour, coconut flour, cardamom powder, baking powder, and kosher salt in a medium bowl. In a larger bowl, beat together the eggs, vanilla extract, and sugar. Mix until the batter lightens in color and thickens (about 2 minutes). Fold in the butter and honey mixture until just incorporated. Add the flour mixture to the batter in three additions, beating on the lowest speed, until the mixture is completely smooth. Pour the batter into the 9x13 pan, and bake for around 25-30 minutes, checking at 25 minutes. The cake is done when a toothpick or wooden skewer comes out clean (not crumbly). The cake will look shallow and dense. While the cake is in the oven, add the coconut milk, condensed milk, whole milk, and cardamom powder to the blender, and blend until thoroughly incorporated. Use a whisk or electric mixer if not using a blender. When the cake is done, remove it from the oven, and keep the cake still in the pan. While the cake is still warm, use a fork or wooden skewer to poke holes all throughout the cake. The holes will help absorb the milk mixture. Pour the milk mixture slowly over the cake, starting around the edges and pausing every so often to let it soak into the cake before adding more. Allow for the cake to soak through in the fridge for at least two hours and up to twenty-four hours. It’s okay if you still have a bit of milk mixture left on the cake when you are ready to add the whipped cream topping. To make the whipped cream topping, beat the heavy cream and granulated sugar (if using) on medium speed with an electric mixer. Beat until you have reached firm peaks (about 5 minutes). 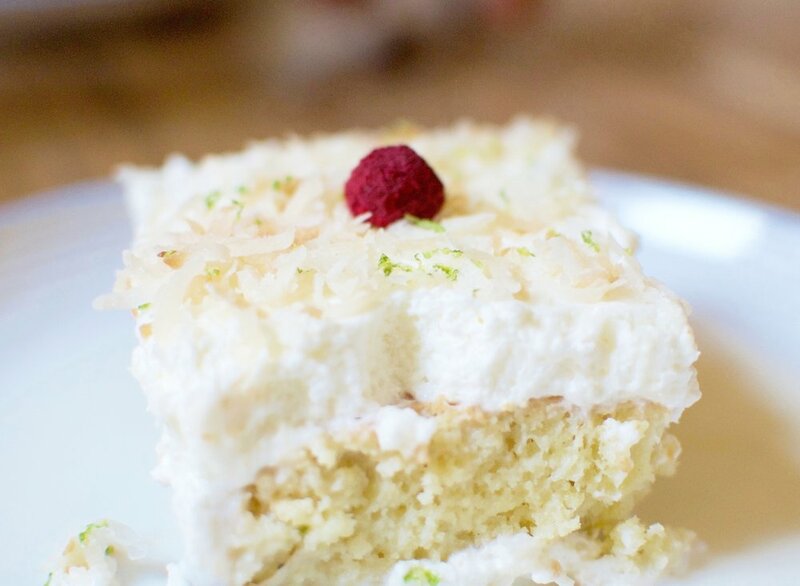 Spread the whipped cream evenly over the cake, and add the toasted coconut flakes on top (to toast the coconut flakes, bake one cup of sweetened coconut flakes on a parchment-lined sheet pan, stirring frequently, at 350 °F for 5-8 minutes - the coconut can burn easily so keep a look out). Sprinkle the zest of one lime directly onto the cake right before slicing and serving. This cake is best served chilled (preferably straight out of the fridge). This cake can be baked, soaked in the milk mixture, and topped with cream up to 2 days ahead. Coconut & Cardamom “Ras Malai” Tres Leches Cake with Toasted Coconut & Lime Zest Whipped Cream is best consumed within 4 days.